prepare the mud and make adobe bricks, there are always many other tasks and ways in which they can offer assistance, and by doing so they will be serving God and the king. I am leaving with the intention of later heading to San Francisco. I will take the families that had stopped in Monterrey. Work will begin on the first mission and I will not move on to the other one until I receive new orders from Vuestra Excelencia to that effect. 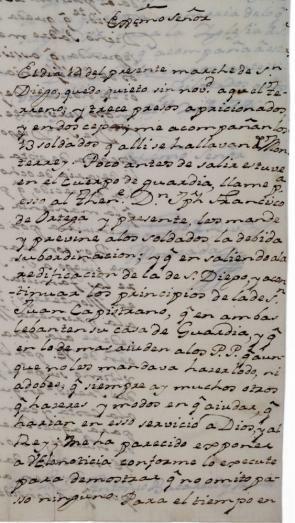 Just recently I learned that the Father President wants to situate the second mission along the riverbank and the route from Monterrey to that port because it would then be far from the fort. Since that is not the order I was given by Vuestra Excelencia, I await further orders. A pdf of a transcript and a translation is available here. Notes: Transcript, translation, and the basis of the introduction by Rose Marie Beebe, Santa Clara University, October 2013. On the 14th of this month I left San Diego. Nothing new to report. All is quiet at that site. Thirteen prisoners shackled and in two stocks. The thirteen soldiers from Monterrey who were there are accompanying me. Shortly before leaving, I went to the guardhouse. 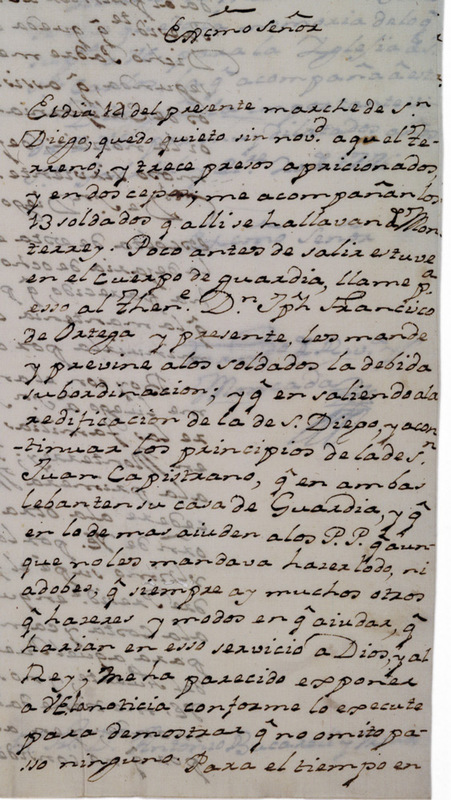 I sent for Lieutenant Don José Francisco de Ortega. As soon as he arrived, I gave the soldiers their orders and informed them that they would be reporting to him. They are to assist in the reconstruction of Mission San Diego and then begin working on Mission San Juan Capistrano. At both missions they are to build their guardhouse. They are to assist the Fathers in whatever manner possible. Even though I am not ordering them to prepare the mud and make adobe bricks, there are always many other tasks and ways in which they can offer assistance, and by doing so they will be serving God and the king. I felt that I should share this information with Vuestra Excelencia exactly as I carried it out so as to demonstrate that I did not omit one single step. . . . I am leaving with the intention of later heading to San Francisco. I will take the families that had stopped in Monterrey. Work will begin on the first mission and I will not move on to the other one until I receive new orders from Vuestra Excelencia to that effect. Just recently I learned that the Father President wants to situate the second mission along the riverbank and the route from Monterrey to that port because it would then be far from the fort. Since that is not the order I was given by Vuestra Excelencia, I await further orders. . . .
May God protect the esteemed life of Vuestra Excelencia for many years to come. San Gabriel, October 20, 1776.